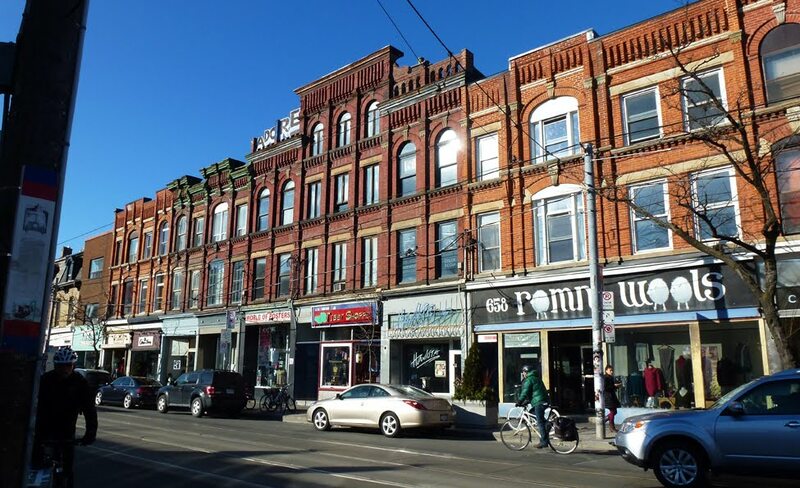 This shot of a sunny West Queen West street scape gives you an idea of the variety of businesses and architecture in the neighbourhood. 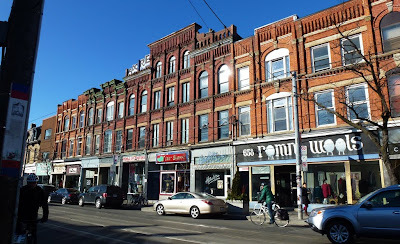 The original cool part of Queen St West (to the east from here) has been taken over by chain stores like the Gap & Nike and upscale boutiques, forcing the artists further west to this area. The same thing is starting to happen here - Starbucks has opened and the rents are rising but it is still an interesting area to wander about in. Meanwhile the artists and galleries are heading a bit further west - a textbook example of the cycle of gentrification! What a beautiful winter day! This looks like a neighborhood I would enjoy. Especially since a Starbucks is now there! Yes, Lyme Disease was first identified in Lyme, Connecticut. One has to be careful in the woods in Connecticut. This so much looks like a street in Amsterdam Red Pat! Wow..specially the light fall on the houses with the stores underneath! I like how the rooflines of each building are just slightly higher or lower than their neighbour. It's still one of my favorite areas to walk around in. Nice light here too! It's interesting how places change over time - become more (or less) 'fashionable'. This looks like a street where it's worth looking up as well as at the shops. I have such mixed feelings about gentrification. It really does work in the favor of most everyone, but shoving artists out to the fringes always gets my goat. Looks like a wonderful place to explore. You're bringing back memories of my time in Ontario! Wonderful old buildings, my kind of area. I like how the height of each building gradually increases to the center. Great capture! I would love to spend a few days wandering about that neighborhood! I find it very attractive! I really like that building! I know this cycle all too well. Like a lot of the buildings in Llandudno, indeed, lots of towns... the upper floors look just as they did when they were first built. But the ground floor facades are in complete contrast with their advertising hoardings, to what stands gloriously above. Hopefully not TOO far west for the galleries Red, progress is a strange and not always wonderful thing! I am glad to see that Romni Wools is still around! Yeah, the little people make something trendy and then the BIG people take over. Doesn't seem fair! Artists lead and the chains follow-West Queen West looks a nice area.